Comfort, warmth and style before or after the game. 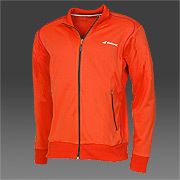 A comfortable and light tennis jacket with a fleece lining to keep warmth under cool temperature. Half neck collar, 2 zipped pockets. Do you own the Babolat Boys Performance Sweat Jacket Tomato?